Several senior executives at First Mortgage Corporation lied about the performance of the mortgages the company originated so they could pull the mortgages out of mortgage-backed securities guaranteed by Ginnie Mae,then turn right back around and sell the mortgages back into new mortgage bonds, defrauding investors out of $7.5 million, the Securities and Exchange Commission said Tuesday. According to the SEC, six senior executives at California-based First Mortgage, including the company’s chairman and CEO, president, and chief financial officer, pulled current, performing loans out of Ginnie Mae mortgage bonds by falsely claiming the mortgages were delinquent in order to sell them at a profit into newly-issued RMBS. 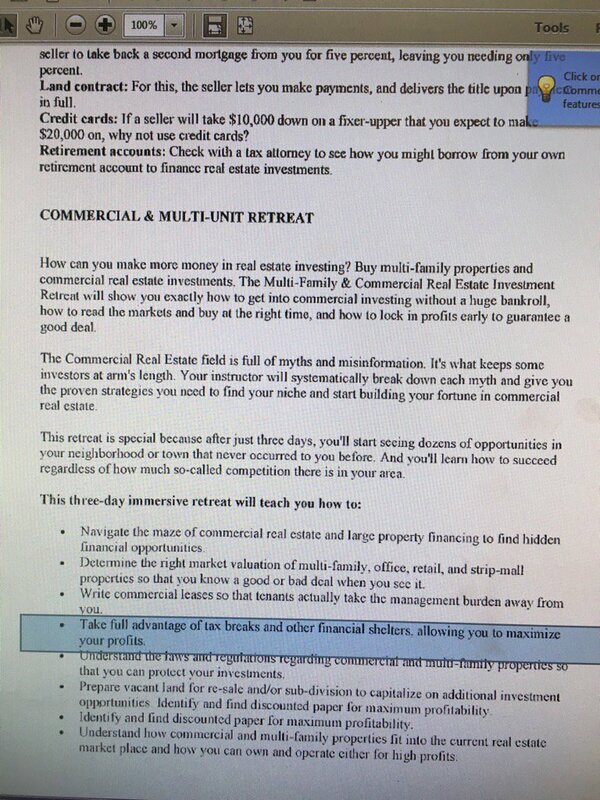 In a release, the SEC stated that from March 2011 to March 2015, First Mortgage and its senior-most executives “orchestrated a scheme” to make the mortgages appear delinquent, by delaying depositing customers’ payments on their mortgages, making it seem like the customers were behind on their payments. The documents released Monday are associated with the Cohen v. Trump case. Will be interesting to view the documents of the playbook that the judge has ordered on Friday to be unsealed. 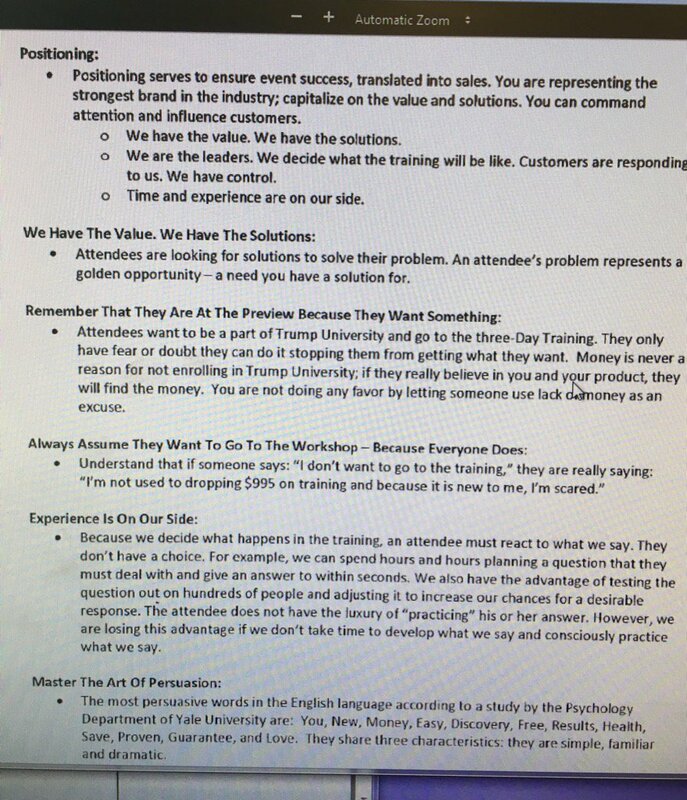 A guidebook for Trump University instructed staff to kick off the real estate seminars by playing “For the Love of Money” by the O’Jays on an iPod shuffle. The book told employees to collect financial information from those who attended and rank them by their liquid assets to see who could afford more coursework. And staffers kept hotel ballrooms at a precise temperature — no more than 68 degrees — at the expensive real estate seminars. These details and scores of others are embedded in thousands of pages of documents that comprise the lawsuits attacking a set of education courses GOP presidential front-runner Donald Trump has boasted about. Guess Who Else Paid Out Big Bucks For Clinton Speeches? Law Firms. According to Bill and Hillary Clinton’s 2015 financial disclosure, most of their income came from book royalties and paid speeches. Clinton has been under intense pressure to release her transcripts from Wall Street bank speeches, but little has been said about her speeches to high profile law firms. These law firms often represent high net worth individuals, and companies. We examined The Washington Postdatabase; take a look at which law firms have paid both Hillary and Bill a pretty penny! From about January 2014 to March 2015, the Clintons pulled in about $25 million for 104 paid speeches, according to a Politico report. The report indicated one of Bill Clinton’s priciest speeches was to law firm Kessler Topaz Metzler & Check in Amsterdam. He received a whopping half million for that speech back in 2014. The law firm has more than 90 attorneys and has been at the forefront of class action litigation for over 20 years. Robbins Geller Rudman & Dowd also paid the Clintons nearly a half a million dollars in less than a year. The law firm, based in San Diego, has 10 offices around the country and specializes in corporate litigation. Just last year, the firm won $7.2 for Enron shareholders. We will keep digging into these speeches, and let you know if any other law firms paid the Clintons. And keep in mind that Delaware is one of the states in which many companies and individuals globally use Delaware as tax havens as well as create shell companies to avoid paying taxes. Delaware has ties to the Panama Papers scandal. As Donald Trump prepared for the Republican primaries, he transferred dozens of his most prized assets, the “Trump” trademarks that adorn everything from hotels to ties to his U.S. golf courses, into a new Delaware-based company — a move that offers him a chance to cut his income-tax bills. By shifting more than 110 registered or pending trademarks to Delaware, Trump consolidated them in a state that doesn’t tax income from royalties on intellectual property. Among the trademarks he moved are his own name and those of some of his best-known properties, including “Trump National Golf Club,” “Trump Tower” and “Mar-a-Lago,” his private club in Palm Beach, Florida, according to records from the U.S. Patent and Trademark Office. Moving the trademarks to his new company, DTTM Operations LLC, will enable Trump to avoid other states’ income taxes on royalties paid for their use — an income stream worth perhaps tens of millions of dollars or more, according to a federal financial disclosure form he filed this month. A former Barclays Plc director was accused by the U.S. of giving tips about future mergers and acquisitions to a plumber friend in exchange for cash and home renovations. Steven McClatchey, 58, who worked in the investment-banking division, told the plumber about 11 impending mergers and acquisitions from March 2014 to August 2015, the government said. The plumber wasn’t named. McClatchey and the plumber met in 2011 or 2012 at the Long Island marina where both dock their boats, according to the complaint. By 2013, they spent most Saturdays at the marina or, in cold weather, playing pool and watching sports in McClatchey’s garage. The plumber used tips from McClatchey to make $76,000 trading stocks including Questor Pharmaceuticals Inc., PetSmart Inc., Emulex Corp. and Omnicare Inc., the government said. Steven McClatchey, 58, was a former employee at Barclays, the bank confirmed. Prosecutors said he worked for seven years at the Manhattan office of Barclays, where he was responsible for tracking the bank’s involvement in potential mergers and acquisitions. He distributed a weekly document to select Barclays employees called “M&A Global Weekly Business Update,” which included deals that were likely to become public the following week. Government officials allege Mr. McClatchey gave tips to his friend who worked as a plumber ahead of more than 10 separate mergers and acquisitions before they became public, including deals involving PetSmart Inc., CVS Health Corp. and Duke Energy Corp. The plumber allegedly paid Mr. McClatchey, in part, by providing “home renovation” services free of charge. The two men became friends about four years ago, when they met at the Long Island marina where they both docked their boats. They began to spend most Saturdays together, the complaint said. The first tip Mr. McClatchey gave Mr. Pusey came around 2013 or 2014, when Mr. McClatchey allegedly told the plumber to “keep an eye on a particular company because something good was going to happen,” according to the complaint. Based on the tips, Mr. Pusey bought securities in at least 11 companies, prosecutors said.